For all types of log files, the log creation and log deletion policies have to be configured. The log creation policy sets when a new log file is started, and the log deletion policy sets when an old log file is deleted. The access and error logging is enabled by default. However, audit and audit fail logging is disabled by default. Disabling the access logging can be useful in some scenarios, because every 2000 accesses to the directory increases the log file by approximately 1 megabyte. However, before turning off access logging, consider that this information can help troubleshooting problems. Log in to the Directory Server Console. 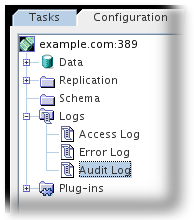 In the navigation tree, expand the Logs folder, and select the folder for the log to enable or disable. 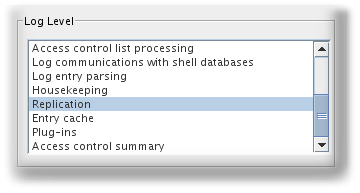 To enable or disable logging, select the Enable Logging check box. If the log is being enabled, enter the full path and file name for the Directory Server to use for logging in the field provided. The default path is /var/log/dirsrv/slapd-instance/log_type, such as /var/log/dirsrv/slapd-instance/access. For further details, see the corresponding section in the Red Hat Directory Server Configuration, Command, and File Reference. For debugging, you can enable access and audit logging for operations a plug-ins executes. For details, see the nsslapd-logAccess and nsslapd-logAudit parameter in the corresponding section in the Red Hat Directory Server Configuration, Command, and File Reference. [27/May/2016:17:52:04.754335904 -0500] schemareload - Schema validation passed. [27/May/2016:17:52:04.894255328 -0500] schemareload - Schema reload task finished. The option to disable high-resolution log time stamps is deprecated and will be removed in a future release. [27/May/2016:17:52:04 -0500] schemareload - Schema validation passed. [27/May/2016:17:52:04 -0500] schemareload - Schema reload task finished. To periodically archive the current log file and create a new one, set a log file rotation policy. You can update the settings in the cn=config subtree using the Directory Server Console or command line. The access mode sets the file permissions on newly created log files. Sets the maximum number of log files to keep. When the number of files is reached, Directory Server deletes the oldest log file before creating the new one. Sets the maximum size of a log file in megabytes before it is rotated. Sets the maximum age of a log file. For details, see the parameter descriptions in the corresponding section in the Red Hat Directory Server Configuration, Command, and File Reference. In the navigation tree, expand the Logs folder, and select the folder for the log you want to update the settings. Directory Server automatically deletes old archived log files, if you set a Deletion Policy. You can only set a log file deletion policy if you have a log file rotation policy set. Directory Server applies the deletion policy at the time of log rotation. If the size of all access, error, audit or audit fail log files increases the configured value, the oldest log file is automatically deleted. When the free disk space reaches this value, the oldest archived log file is automatically deleted. When a log file is older than the configured time, it is automatically deleted. Move or rename the log file being rotated so that the old log file is available for future reference. Both the access and the error log can record different amounts of information, depending on the log level that is set. For further details and a list of the supported log levels, see the corresponding section in the Red Hat Directory Server Configuration, Command, and File Reference. Changing the log level from the default can cause the log file to grow very rapidly. Red Hat recommends not to change the default values without being asked to do so by the Red Hat technical support.